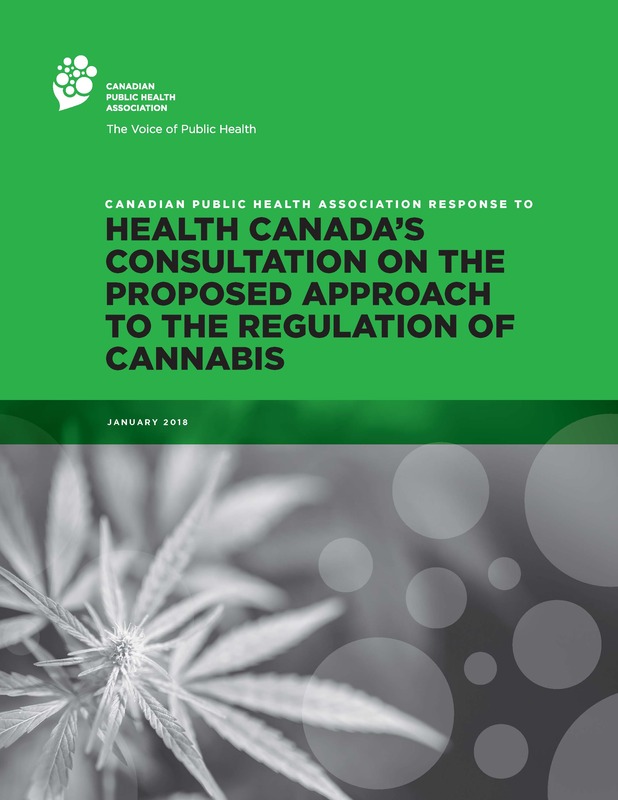 In November 2017, Health Canada released a consultation document describing the proposed regulations that are being developed in support of the Cannabis Act.1 In order to ensure that the structures necessary to permit the sale of cannabis will be in place by 1 July 2018, Health Canada has developed these draft regulations in advance of the promulgation of the Act. That document described the proposed regulations falling within the jurisdiction of Health Canada and would control the sale of cannabis at the federal level.2 It also provided several questions for consideration. This briefing presents CPHA’s perspective on the proposed regulations. CPHA has described our position in support of the legalization and regulation of cannabis to the federal taskforce concerning the legalization of cannabis, and to the consultation concerning the legislation at Second reading in the House. More recently, the Association has released a formal position statement describing a public health approach to the legalization and regulation of cannabis. As a result, this response focusses on the 12 questions provided for consideration in Health Canada’s consultation document. Of these, questions one through five address concerns related to the proposed types of licenses that would be available, the threshold between micro and standard participants in the industry, the proposed rules and requirements for the different categories of authorized activities, and the requirements for security clearances for responsible persons within a cannabis-related business. These types of activities are outside the Association’s ambit, and will not be the subject of specific comment. Two general comments should be noted. First, question four raises an issue concerning whether the requirements for licensing are proportional to the public health and safety risks of the product. As the proposed regulations appear similar to those for medical cannabis, we believe that the public health risks will be mitigated by these proposals. We also note that the experiences from legalization of cannabis in certain jurisdictions in the United States support beginning with more stringent regulations, while providing for their loosening as the evidence develops to support such action. As such, maintaining the approaches used for medical cannabis during the start-up of the recreational market appears appropriate. Evidence, however, should be collected and evaluated to determine the success of these regulations in meeting the goals associated with legalizing cannabis sales. We also realize that the success of these regulations will be dependent on the technical requirements described in the supporting documents. We look forward to reviewing those documents as they are developed. Second, on a more technical issue, the proposals appear unclear concerning the regulation of high cannabidiol (CBD), low tetrahydrocannabinol (THC) products. Would such products be considered industrial hemp should the level of THC be less than the stated threshold and health claims are not present? With respect to the additional questions, our responses are provided below. This question asks whether individuals who have criminal records should be permitted to receive security clearances necessary for employment in companies that grow and sell cannabis. One comparator for this question might be the regulation of the alcohol industry, particularly in the province of Ontario where the Alcohol and Gaming Commission of Ontario (AGCO) require that applicants for licenses to manufacture alcohol be subject to a police records check. The AGCO has indicated that it is looking for “honesty and integrity” in the applicant; as such, there is no absolute ineligibility based on the existence of a criminal record, should the applicant disclose its presence. A similar approach would appear appropriate for those seeking licenses for growing and manufacturing cannabis. Similarly, a ban against those with a criminal record working in the industry would represent a form of structural violence, where the presence of that record would prevent access to employment. Should the individual have completed their sentence and demonstrate honesty and integrity, then they should be permitted to receive the security clearance necessary to be employed in the industry. CPHA appreciates the value of permitting the sale of products such as pre-rolled dried cannabis, cannabis oil capsules and oral sprays, should this permission include the establishment of specific maximum amounts of dried or fresh cannabis for the pre-rolled product, or a maximum THC concentration for oil and spray products. This approach is presented in the regulations and is viewed as a means of managing consumption of such products. However, limitations should be considered on the packaging and labelling of such products, particularly pre-rolled dried cannabis, to prevent their use in advertising, particularly to minors. Similarly, CPHA recognizes the benefit of initiating a sales regimen with a restricted number of products, and the selective introduction of additional products as the market establishes itself, and the processes for managing that introduction, especially of edible products, develops. The establishment of maximum THC levels for selected products is viewed as one means of assisting individuals in establishing safe consumption habits. As such, CPHA supports these limits. It is noted, however, that no maximum concentration of THC has been established for dried or fresh cannabis. The Association’s view is that limits are necessary as a means of maintaining a consistent product for consumption, thereby helping to reduce the likelihood of over-consumption. We also recognize that there will be a requirement to indicate the THC concentration on the product label. Such an approach, however, requires that the information be easily observed, and that the consumer be aware of both the indication of THC content and the effect caused by higher concentration products. An alternative might be to require labelling nomenclature, similar to that provided for beer products, to demonstrate the relative concentrations of THC in the product. CPHA is supportive of the draft regulation controlling packaging and labelling of cannabis-containing products, as they appear similar to the plain packaging legislative proposals for tobacco (Bill S-5) and closely resemble approaches previously advocated for by the Association. There are two points, however, that could be strengthened in these proposals. The first would be to require product names that indicate the relative concentration of THC, as described in the previous question. The second concern is related to the development of rotating mandatory health warnings. Such warnings should only be required when the available scientific information fully supports their inclusion. CPHA advocates for restrictions on the availability of medical cannabis when the recreational market begins. CPHA’s proposal was to limit the availability of medical cannabis to those under the legal age of purchase for the recreational product and to those who require it for medical purposes, or the recipient requires a product that would not be available through the recreational marketplace. We maintain this position and recommend altering the medical cannabis provisions to reflect these restrictions. This provision is based on the information from the states in the United States that have legalized recreational cannabis use while maintaining a medical cannabis marketplace. Regulatory agencies in those states have noted the challenges of managing and enforcing the provisions of two systems and recommend that only one system be maintained. CPHA also recognizes that an abrupt change to the current medical cannabis regulations may cause disruption for certain users, and appreciate the efforts to manage the introduction of recreational cannabis use while causing minimal disruption for medical cannabis users. We believe that the data collection and program review steps proposed within the regulatory package represents a reasonable compromise during the introduction of recreational cannabis to the marketplace. CPHA recognizes that the existing regulatory systems for prescription, non-prescription and natural health products (and their veterinary equivalents) have been used to license-for-sale a variety of cannabis-containing products in Canada. The precedents established under those regulatory requirements seem to address the intent of the Cannabis Act. Our sole concern would be to the provisions concerning their marketing and sale to young people. In our view, the intent of the Cannabis Act and Regulations should take precedence over the existing regulations. The proposed regulations address many of the concerns associated with access by youth, product appeal to youth, packaging and promotion, and labelling that form the basis of a public health approach and align with federal roles and responsibilities. Due diligence, however, is required to foster similar actions by provinces and territories, and subsequently with municipalities. Similarly, on-going efforts by all levels of government are required to support the development and implementation of health promotion activities, harm reduction and treatment services, and surveillance activities necessary to fully implement a public health approach to the legalization and regulation of the sale of cannabis-containing products in Canada. 1 The Cannabis Act is at second reading in the Senate as of January 10, 2018. It is anticipated that the July 1, 2018 deadline for Royal Assent will be met. 2 The regulations that support the responsibilities of Public Safety Canada and the Department of Finance are subject to separate consultation processes.